You could ask any woodworker about what they wish the most in their shop, and you will almost always get the answer that they could use some extra space. Still, they go out to collect more tools and machinery till fill up the already too small shop space. I am one of those woodworkers. And a toolaholic. Like all woodworkers, I have a too small workshop. In my case, the shop is actually really small. We’re talking about a size of 3,80 x 4,00 meters. That translates into 12’ 6” x 13’. Like many woodworkers I started in a single car garage. My woodworking gear had to share the space with buckets of paint, winter tires, gardening tools and even the cat’s litter box, among other stuff that had nothing to do with my hobby as a woodworker. A few years ago during a major remodeling of our house, we needed some more space for the new dining room. Of course, that meant that the laundry room had to go. Otherwise, the space had to come from the one car garage. And then it wouldn’t be a one car garage anymore, now would it? Unfortunately I can’t recall what technique my dear wife used to convince me that taking the space from the garage/workshop was not only a valid solution to the problem, but actually quite a good idea. I could use that negotiation technique in a number of situations. The dining room had to be 1,5 meter (60″) wider and the laundry room 0,5 meter (20″) wider. The 2 meters (80″) had to come from the one car garage, which obviously couldn’t be called a garage anymore. The gar… …space that no longer was suitable as a garage could be my shop. It doesn’t sound like a very tempting deal yet, right? The units in the skech are metric, but they can easily be converted into imperial using the unit converter in the link at the bottom of ths article. As you can see, I placed the doors in a straight line to be able to handle long work pieces. The windows are placed in the top parts of the walls, making it possible to use all wall space for work stations. To get the maximum space out of the room I used a sloped ceiling. There is 300 mm (12”) of fiberglass insulation in the roof and 200 mm (8”) in the walls. The insulation thicknesses are actually on the lower side according to the local code in this part of Sweden. There is no need for heating the space, since there is enough heat leaking into the shop through the wall from the rest of the house. All doors in this part of the house are placed in a line. That means that i can handle infinitely long pieces. In theory at least. The shop is not finished yet. I am currently working with some storage cabinets for the shop. 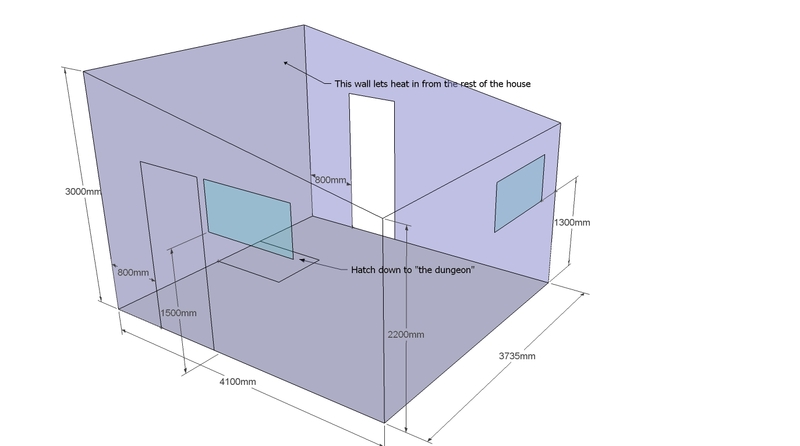 The idea is to use the 800 mm (32”) wide space on both sides of the hatch to the dungeon to build kitchen-like cabinets specially designed to accept Festool/Tanos-systainers. The cabinets are indeed needed. More on that later. 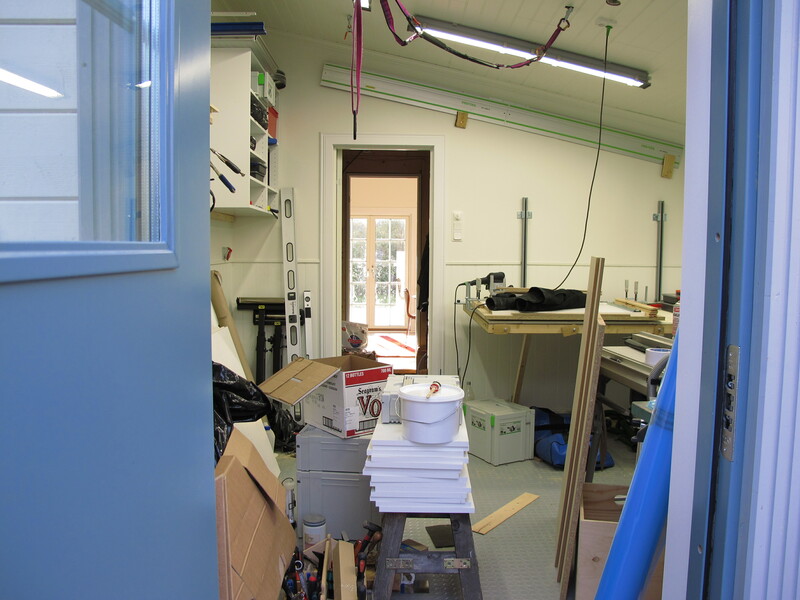 Next part of “the micro workshop” will cover the electrical- and some other installations. Very much looking forward to seeing more on this. Am currently in the process of re-working my super small workshop (6.0m x 1.8m). Fortunately living in Perth, Western Australia, I am able to use the adjacent car port pretty much all year round meaning the workshop is primarily a tool store.